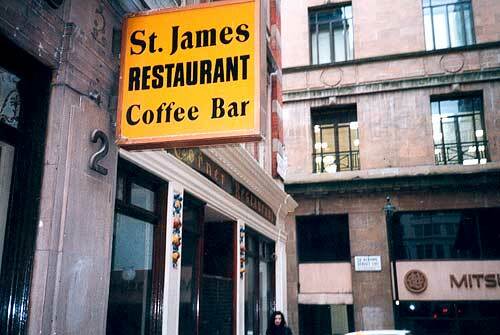 These are the best of the classic cafes left standing largely unharmed in London. Note that most keep odd early closing times at the weekends - and often during the week for that matter. Few open more than a couple of hours on Saturdays. In the long-term all are under threat. Catch 'em now whilst they're still standing. Click here > for an at-a-glance Top Ten cafe guide. Click here > for Central London establishments. Click here > for the abbreviated No. 8 bus London Caff Tour. The City is a truly terrible place for Aroma style coffee cesspits so stumbling across this fine frontage in the shadow of Richard Rogers' monument to Mamon is an especial treat. This has completely escaped the ravages of other local establishments - all viciously subjected to high-finance make-overs. The sign is large and brown with a period font and boasts an old illuminated Coke sign. Inside it's 50s stools all round with a couple of nasty modern silver tables providing the only proper seating. This is a great place just to look at from the outside and then move on. Heartwarming. Barely noticeable amongst the French brasseries this little hideaway has decent seating but a rather nonedescript interior. Not as good as the nearby Sidolli [opp. Goodge St tube] but it breaks up the monied monotony of Charlotte St now the plucky little Venus Kebab House has been shut at the lower corner of this boulevard of broken expense acounts. The name is better than the actual establishment but for the brilliant array of polished wood chairs and tables alone this is worth inclusion. All of them in full-on classic mode and proudly displayed. Like the Highbury above it has decent wall panels but an utterly bland interior otherwise. Pity about the wretched metal doors and window surrounds. Tiny. Standing only but excellent formica interior. Gilbert & George's local! V. Rough. odd int. composed of mismatched second hand seats and odd junk tables. Open only from 1.00am to 1.00pm. G & G live opposite down a few doors in a massive Huguenot house. Occasionally they have been known to serve in the caff. Also thought that they pumped money into keeping the place going through hard times. Heartening. Good ext. sign. is all that remains. Good local cafe with plain int. Useful little cafe off Piccadilly. Good sign and a few booths. Worth a look. But eclipsed by the glories of The Euro Snack Bar nearby. Good local cafe opposite the Forum venue. Good n' dingy - fair int. Good Italian - great brown formica banquettes and great specialist chips! Once part of a mighty local family chain. Right next to Hawksmore's masterpiece church in Spitalfields. Fair interior. Fine seating but naff outside sign - opposite large Homebase store. Good beige booth seats in a fine little enclave off Holborn. Large back section and good counter and tea machine. Hole in the wall in the lost dusty Cross. Good dark brown moribund interior that is always too hot. Pleasantly scatty old lady runs the joint. 2 very good 70s style lounge-ish emporia one with excellent and extensive mustard coloured leatherette seats and open all week very late. Very Americanno in feel. Good sign; great old couple rudely taking orders; dirt cheap but so-so interior only! Stupendously abysmal service. Magnificent chairs and tables - ugly view onto Walworth Rd - pensioner action guaranteed. Small and scuzzy but good seats. Endlessly arguing staff. Poor ext. sign. Nice hidden family restaurant expansive upstairs eaterie. A Guardian fave.